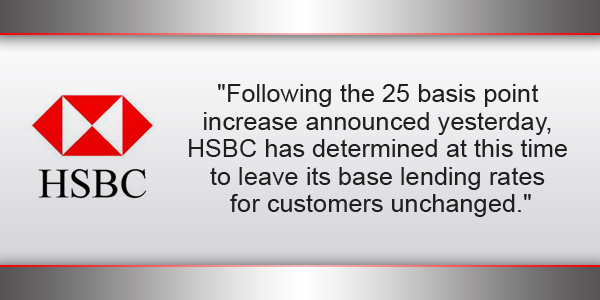 Following the 25 basis point increase announced yesterday, HSBC Bermuda said they will “leave its base lending rates for customers unchanged” at this time. The company said, “HSBC Bermuda assesses a range of macroeconomic and other factors in determining the bank’s base lending rates. The US Federal Funds Rate is an important one of those factors. “Following the 25 basis point increase announced yesterday, HSBC has determined at this time to leave its base lending rates for customers unchanged. Let’s all switch our mortgages to HSBC. The devil’s in the fine print. HSBC will get it back in other ways. Trust me, they will up it soon.